Mrs. Tucker, the teacher who owns Artimus the Goose of Michaelmas fame, has instituted Fabulous, Fun Fridays in her 3rd and 4th grade science class. I learned this when she appeared with a lizard in a cage one Friday. She explained that the lizard was a North Carolina Anole and the kids were going to observe it during Fabulous Fun Friday and then they would release it. Well, my chickens were not going to be upstaged by a silly lizard. I asked if I could bring a chicken on the following Friday. Mrs. Tucker, the teacher, was thrilled. That is how last Friday became Take Your Chicken to Work Day. I tried to convince Beekeeper Brian to take a chicken to work, but he wasn’t sure they would handle the hour-long commute very well. I thought long and hard about who to bring and decided Samson was the best choice. He is a rooster, but still he fit in the same category as the chickens. I told him all week that he was in for an adventure on Friday. I’m not sure he quite understood. When it was time for his appearance, I put him in a dog kennel (without a dog in it) and drove him to the school. He was very quiet. 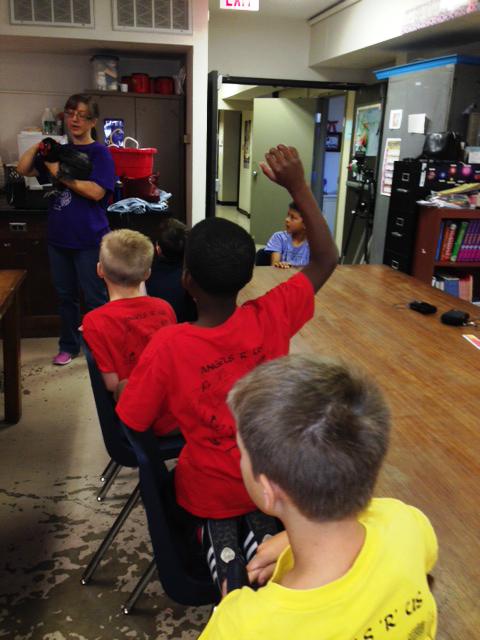 The students were told to remain calm and still – very hard instructions for 3rd and 4th graders. However, they did a fantastic job as I held Samson and talked about his rose comb and the feathers on his feet. They were fascinated. Then Mrs. Tucker told them if they were really still, I would put him on the table and let him walk around. They were perfectly still and Samson stood on the table. He wasn’t really sure about walking around. I imagine the table felt different than the ground in the chicken yard. 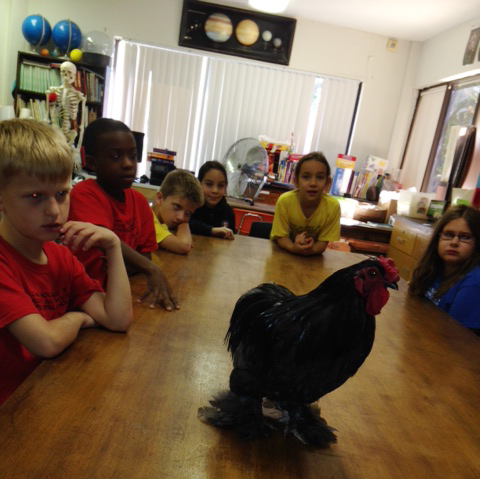 I’m not sure who was more curious, Samson or the students. Each student then had the opportunity to hold Samson. 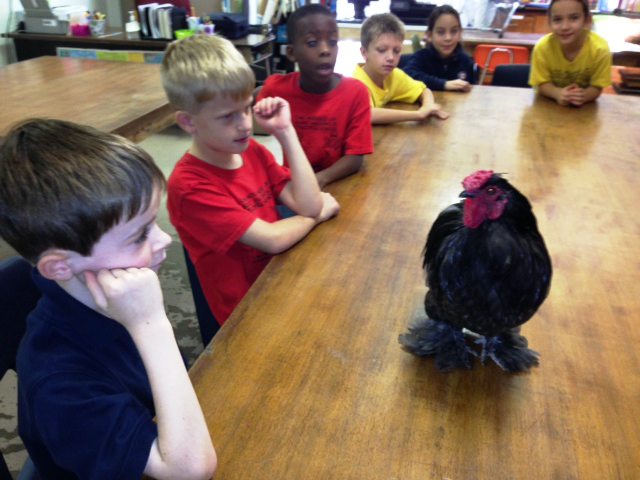 Mrs. Tucker explained that chickens poop whenever they need to so Samson would sit on a towel just in case. Samson patiently allowed all 10 students to hold him. As soon as I returned him to the kennel, he pooped. He wins the Best Behaved Rooster Award for sure. No way a lizard could compete with that.